Grundfos is a global leader in advanced pump solutions and a trendsetter in water technology. Grundfos is a leading player in the pump industry. With advanced pump solutions, finding ways of using new technologies to move and treat water and wastewater, their environmentally sustainable approach to solutions from start to finish and ground-breaking technologies. 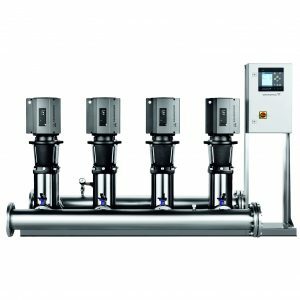 Grundfos are responsible for solutions the world has never seen before, from the ground breaking vertical multistage units through the integration of VFD into pump motors, and onwards to new household compact ground breaking designs. They are responsible for a number of common day innovations, saving, power, the environment and your budget. ame are a very close and proud partner with Grundfos, and have been for many years, supplying the best quality, best environmental, and budget conscious solutions to industry and residential installations for well over a quarter of a century. ame & Grundfos a perfect relationship. 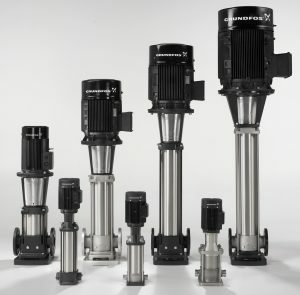 From small transfer pump units, through boiler feed, to the ubiquitous CR range of pumps, inline transfer and pressure boosting, submersible, sump and dosing, we are proud to consider Grundfos for residential, industrial, food and beverage, building services, mining and water supply projects be they large or small. 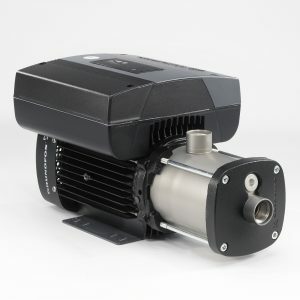 Grundfos has an outstanding reputation within industry, and they must be doing something right as there are a lot of unknown brands, unsupported knock offs and similar looking pumps out there ! Purchasing from an authorised distributor makes sense from a warranty perspective, but purchasing through ame means you also get decades of product knowledge, decades of on site experience, and that means you get the after sales support you deserve and demand. From our point of view it means we can supply the right pump for the job, the first time, offer you the support you need to install it correctly, and competently sort things out down the track when it needs servicing. It is compact, noiseless, reliable and flexible, and this makes it an optimal solution for installation and interaction with other components in a large system. It can be installed in systems or used as a stand-alone pump, and can integrate with it's 'e' motor into most systems for integral VFD controlled precision. The Hydro MPC is a masterpiece. With flows from only a couple of cubes an hour up to 900 m3/hr the Hydro MPC can deliver perfect pressure control across a range of flows. One system can service small taps through to full process flows, with full BMS interfacing, remote logging, and a myriad of customisable additions and control options. We have them pumping water to RO units, delivering temperature controlled water to brewers, and supplying water to hospitals, you can find our units in golf courses, caravan parks, mine sites, and small townships. Indeed, anywhere you need a constant pressure irrespective of flows, you should probably find a Hydro MPC system. The Grundfos AutoAdapt system allows you to utilise the latest technology in your sumps. A submersible pump that understands what is going on, doesn't need float switches to automatically start and stop and can 'talk' to other pump of the same ilk in the sump to determine duty standby / duty assist / duty duty, dry running, overload, auto start rotation, and all without an external control. Auto Adapt is built into a range of sump pumps and circulators. anywhere there is a sump !